Then I loaded up the Roll 20 app which I had set up earlier in less that 15 minutes, sent out invite and used that on my main screen. On my vertical side screen I had the Hangout and various PDFs open. The map is a +Dyson Logos . Its a perfect dungeon for what I needed. Support his Patreon for more awesome maps for the RPG community. Find his maps at his blog. I use Fog of War to show may players what they can see and where they have been. I reveal new parts as the party progresses. Sure, part of the fun and challenge from my teen and college years was the mapping. Well, not really. No one ever wanted to be the mapper. Now, its not an issue. Notice something missing? Tokens. I never use them. I could. Maybe I should. I have access to hundreds, if not thousands of them. Instead, I go more theatre of the mind. Maybe at some point in the future I'll find a nice middle ground between not using them and using all the bells and whistles. I do use character sheets now. They actually have ones coded for Swords & Wizardry. I'm impressed. I roll all attack rolls, damage rolls and 99% of adversary saves in the open. I think players trust the DM to do what is right behind the screen when the rolls of chance are all in front of the screen. 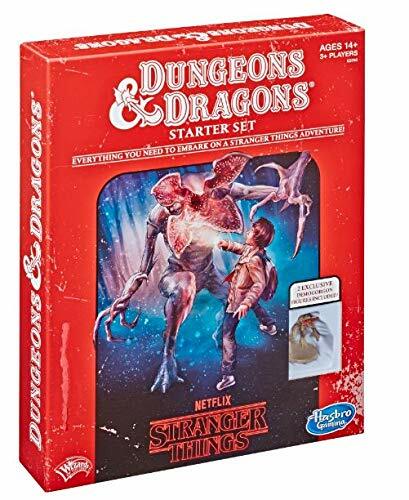 As a DM, I want the players to think out of the box. You want your halfing fighter to make a running leap into the half dozen skeletons coming at you, trying to knock some over and block the doorway at the same time? Sure, make an attack roll with a penalty of 2 to the roll. Oh, in case you missed it, here's Tim's blog post of last night's session. 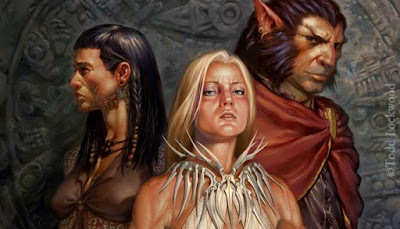 ACKS is a great system, kinda like Labyrinth Lord with racial classes (note, I didn't say Race as Class - there is a difference and ACKS handles it well) Then you have the ACKS Player's Companion. You want a set of rules, charts, costs and balance checks to create new classes for the OSR game of your choice? This is the book for you. 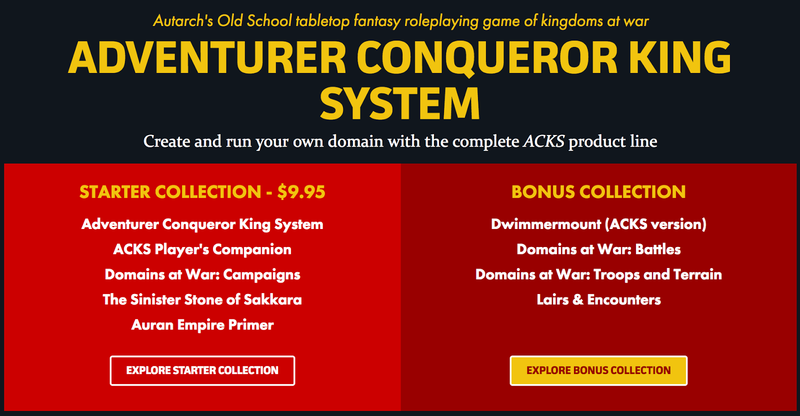 Looking to handle larger combats or military actions? Check out the Domains of War books. Lairs & Encounters is practically worth the price of admission to the Bonus Collection (currently just under $20) on its own. Don't forget Dwimmermount. Even if you don't run it as is there's simply a huge amount of material to mine. I strongly suggest the Bonus Collection if you can afford it. I don't play Pathfinder. Quite simply, there are just too many rules for me to follow, let alone remember while playing. Still, it is a well written system and enjoyed by a very large segment of the RPG community. 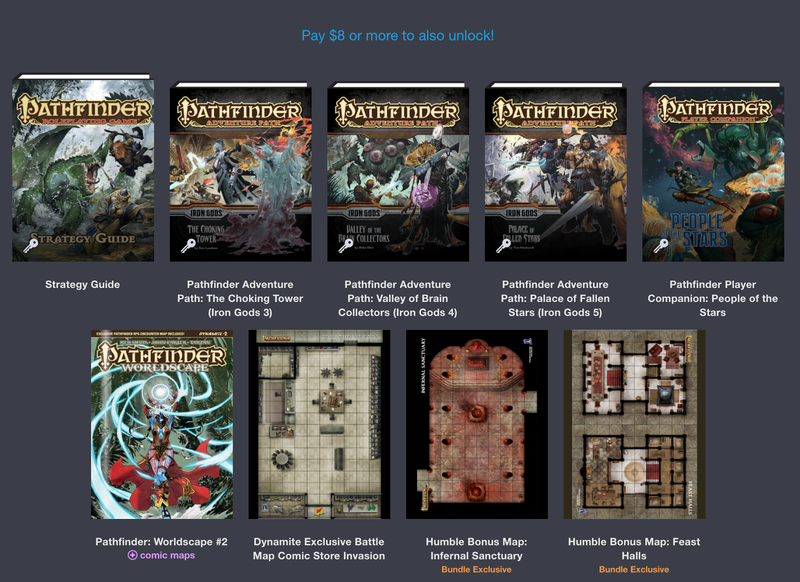 So today I'm highlighting two Pathfinder deals. Then we have the Pathfinder Humble Bundle. 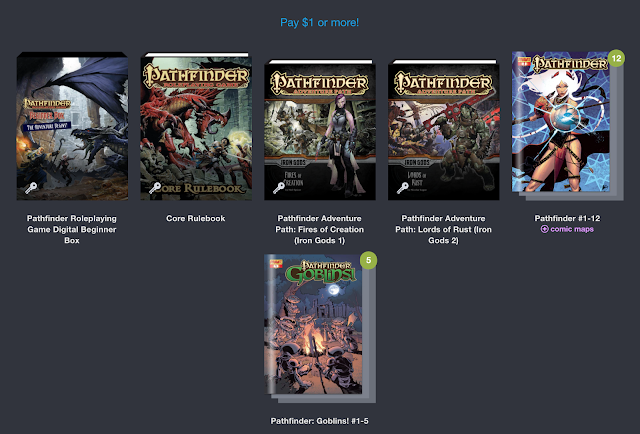 Just in case you are a Pathfinder player without the proper basic resources - oh, and comics! The success of the Livestream is YOU and YOUR questions, so think of some and join us live tonight. I'll update this post and throw up a new post when we have the link for the livestream ready. Hopefully we'll have some Swords & Wizardry Light news to share. Doug Rhea has Stage 4 Colon Cancer and is currently receiving chemo. The medical expenses his family is incurring are very large. In addition to being the main man behind the yearly NTRPG Con (which loses money every year because of Doug's desire to throw the "Best Gaming Convention Ever!") 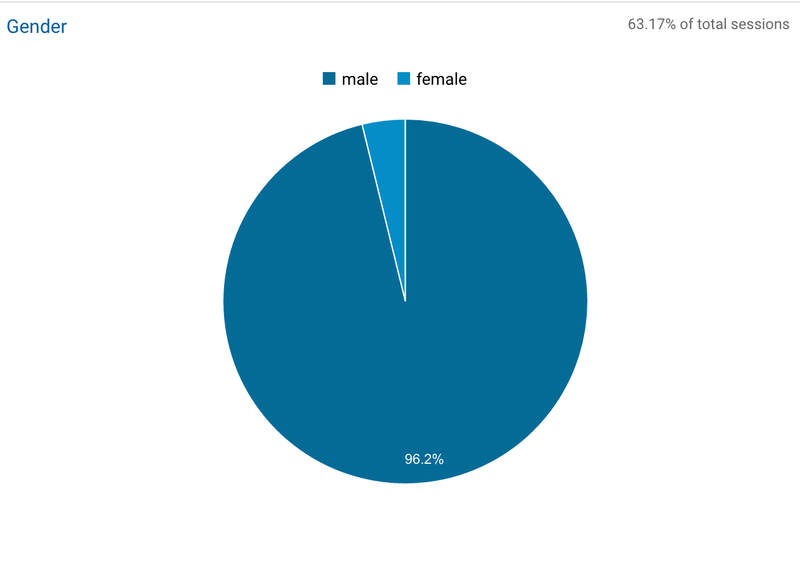 Doug is very active with Shroud of the Avatar (an on-line game and community) since Kickstarter. Although the GoFundMe has benefits for those that donate and are in the Shroud of the Avatar Community, Doug needs all of the support the various gaming communities can give him and his family. If you've ever attended NTRPG Con, you should know that the awesomeness of the Con itself is directly related to Doug's generosity. Lets see if we can return the favor in this time of need. Those pledging $50 or more will receive a free pass to NTRPG Con courtesy of Doug. The campaign is on behalf of Doug (IronMaiden) Rhea. Doug recently (and unexpectedly) discovered he has stage 4 colon cancer. Doug needs $25,000 to cover overwhelming medical bills. 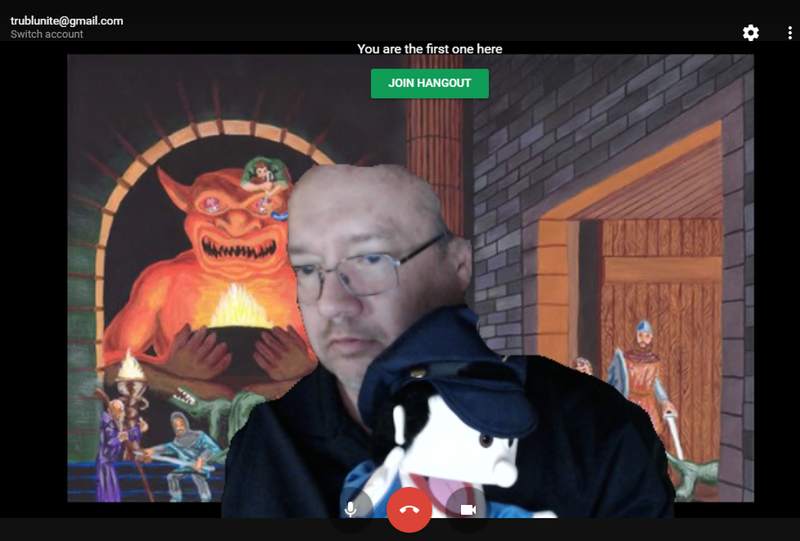 Doug is an avid gamer and a major supporter of Shroud of the Avatar (an on-line game and community) since Kickstarter. Doug has 7 accounts + add-ons (and no time/energy to play) and would like to sell them to help pay for his unexpected medical bills. As a community of SoTA players, we can help Doug (our fellow Avatar) relieve the pressure of finances and focus on what is important: healing and getting well. We will buy Doug's accounts (via this GoFundMe drive) and hold a charity auction for all whom contribute in this campaign (donating $100 or more). All proceeds will go to Doug (up to 25K) and the remainder will be put into a charity for other Avatars who are in desperate need (per Doug's request). He only seeks to recoup his investment and then wants us to help others. 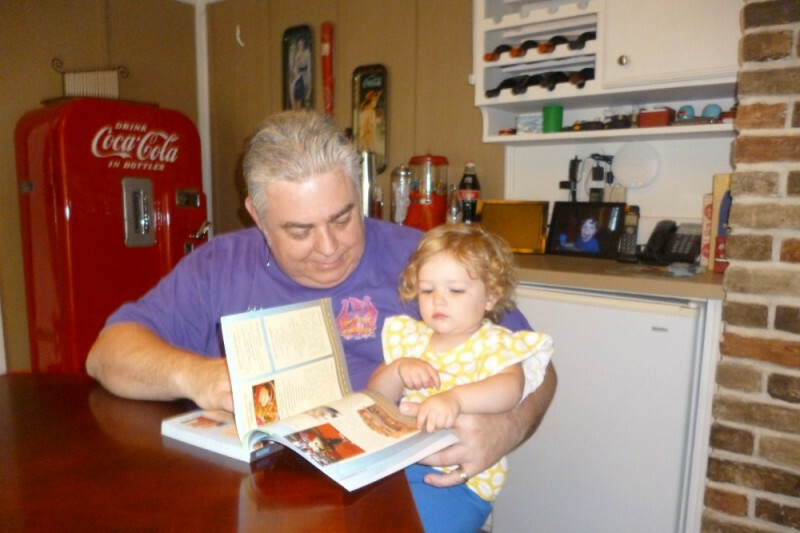 Doug is 53 years old, married with 1 son, and 3 beautiful grandkids: Daegan 6, Cora 2, and newborn Griffin. Dougs still runs a BBS (gamemastersrealm.com/client), collects old BBS game doors (BBSFiles.com), hosts game servers for Never Winter Nights (nordock.net), and game servers for Quake, Tribes 1, Tribes 2, Wolfenstein, Freelancer and even an old Shard for playing the Ultima Online Renaissance. Doug is an early backer of Shroud of the Avatar and has 9 accounts ranging from Lord of the Manor to Edelmann. Doug also hosts and runs the North Texas RPG Con (ntrpgcon.com) every year. 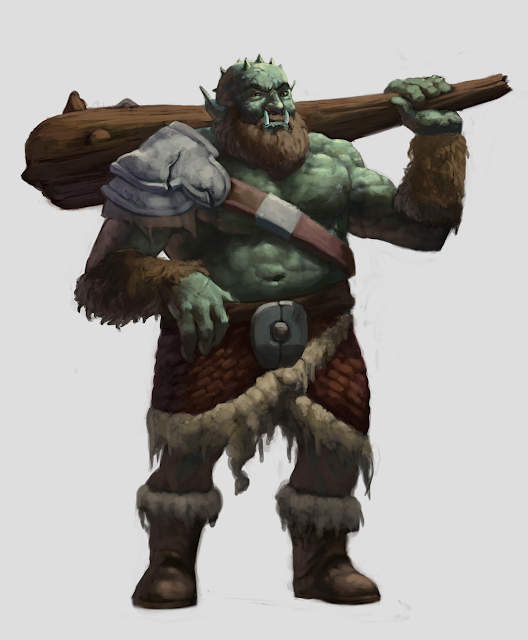 Avatars who pledge $50 or more will receive a free pass to the North Texas RPG Con courtesy of Doug (travel and lodging not included). 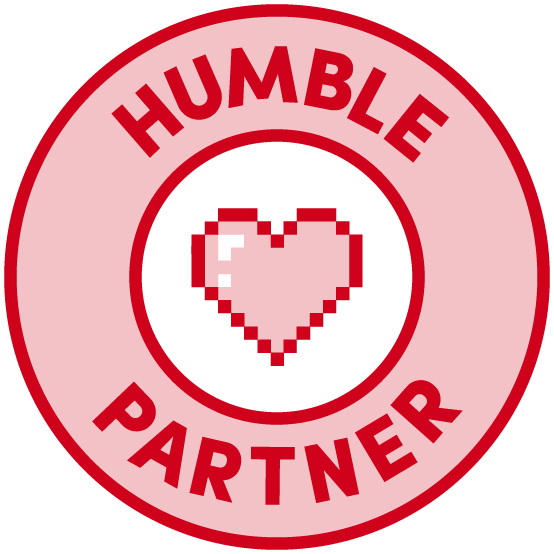 Avatars who pledge $100 or more will be invited to participate in an exclusive charity auction for Doug's accounts/deeds/add-ons. This auction will be commission free and provided by Shroud Marketplace. Its Wednesday, so that means another Tavern Chat from 9PM to 11PM, using that chat box on the right. Swords & Wizardry Light got some edits, updates and corrections to the Word file. Plus whatever else the community decides. Go figure, a time sensitive post. 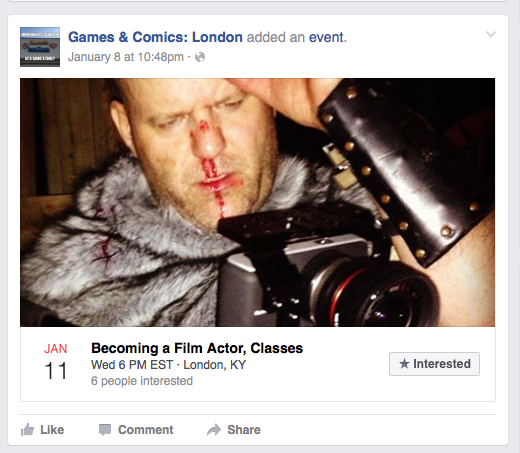 Yes, none other than our very own #ConManKen is offering acting lessons tonight at 6PM in London, KY. Remember, those that CAN - DO. Those that CAN'T - TEACH. 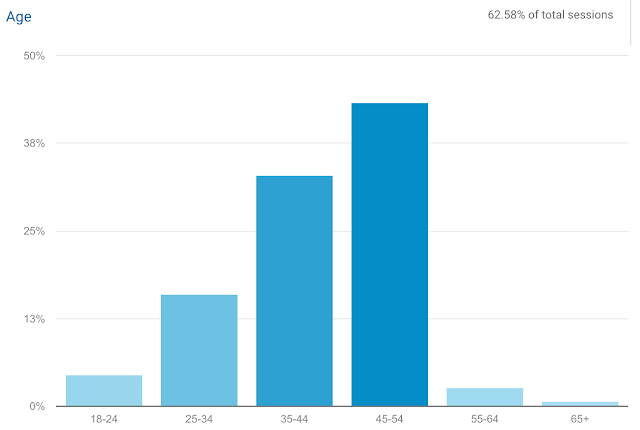 I suspect this is one of those situations that falls squarely in the middle with the expected mediocre results. 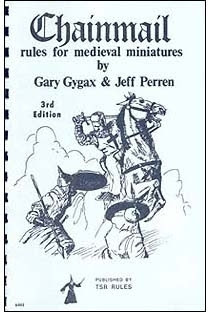 Chainmail is $5 in PDF. Shall we do a mic drop? Sure, there were other releases for TSR Tuesday - Print and PDF - but does anything come close to Chainmail? I'm writing on a post for SW Light. First, great idea to slim down the ruleset! Second, I have some questions + I found a typo. "...Leather Armor AC 12." - Shouldn't it be AC 7? 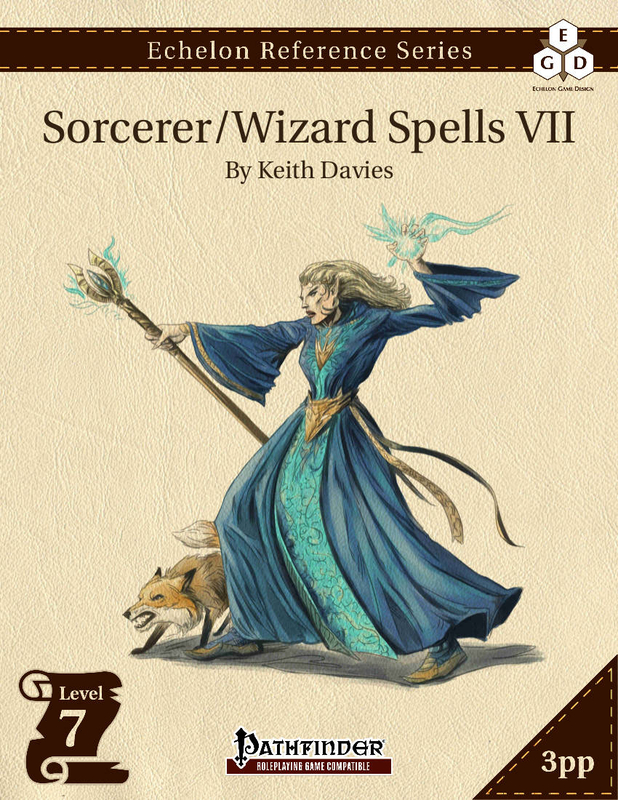 Does the game assume that the reader knows Swords & Wizardry rules? You mention that you can use the bonuses for different things, for example, STR bonus for Fighters to hit. But there is no table for the bonuses. AFAIK the modifiers between various editions are slightly different. ET - The morning tea hasn't quite kicked in, so I can't say for sure we explained that you roll a D6 for Hit Dice. A D20 and D6s are, however, the only dice used in the game. That was to simplify the learning curve, as I've noticed new players often have difficulty telling the different sized dice apart. Does the M-U get no starting weapons, no dagger? Per rules as written he only gets a spellbook. ET - That is a big "oops". Dagger or staff. I'll update the Word file later today. 4. Does spellcasting require a test? Couldn't find an explanation, just that the M-U prepares spells. All the questions may be redundant if you assume familiarity with S&W Complete. But then it wouldn't be necessary to explain a lot of other things. ET - Excellent questions. It should be noted that the Swords & Wizardry Light Word Doc will be the living document for SWL. All corrections and edits will be made to the document you see in the SWL download folder. I'll make sure to add a "date updated" to the last page, so you know how current a copy you have. If and when there is a 2nd printing of SWL we'll make sure to include the fixes and corrections. 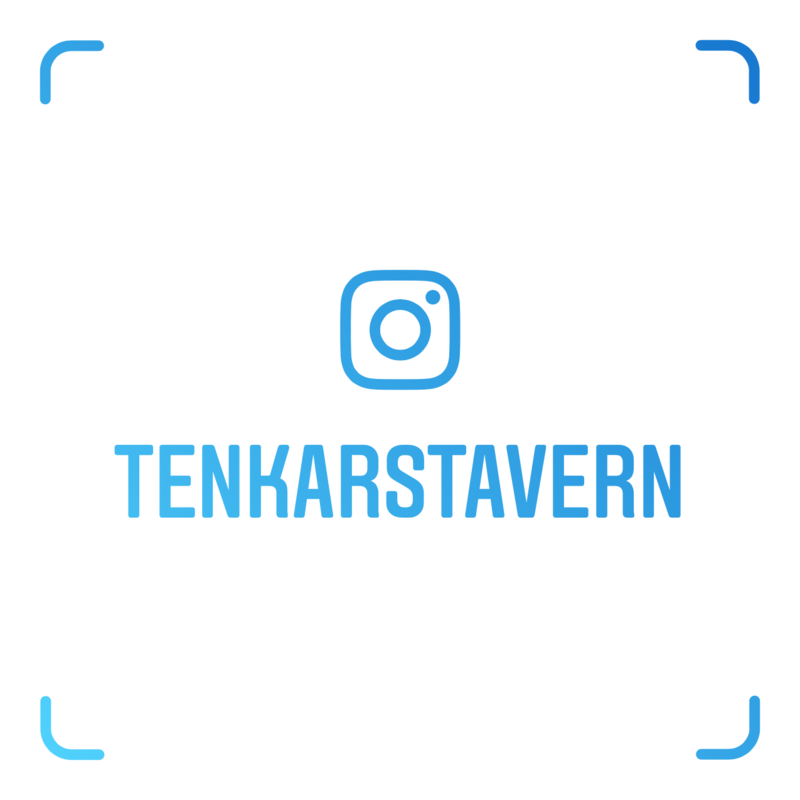 Please send any questions / clarifications / unlawful gratuities to tenkarsDOTtavern at that Gmail thing. Put SWL in the email title if you could. State of The Tavern - Light Posting Week and Time Sinks, Oh My! Yep, just like last week was fairly light, this will probably be another, even lighter, posting week. I need to finish some work for +Pete Spahn , get the Tavern Talk Live podcast conversion of the Livestream done, probably record another Livestream with +Zach Glazar and deal with the ongoing drama that is my mother's cousin (amazingly NOT kicked out of Assisted Living her first weekend, but damn it was close). This is a hellova time sink. Oh, and a dozen or so other responsibilities that have crept in. Heh. Fun times. Oh, did I mention the metric ton of product I need to review? 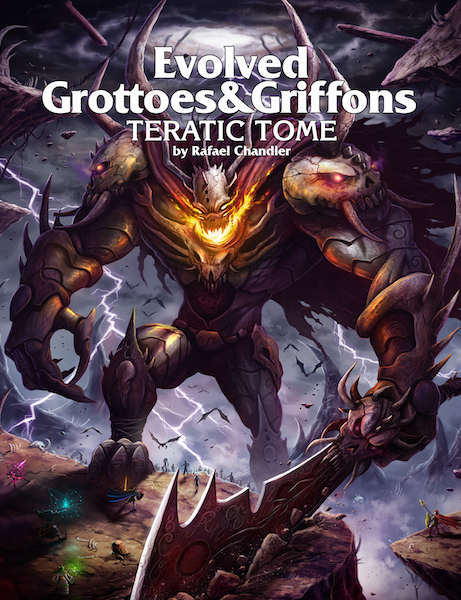 Amazing stuff like Bard's Gate, Blood in the Chocolate, Hubris, Gramma World and others. I may need to lock myself in a room for a couple of hours a day to get all caught up. The Save or Die! Podcast is continuing in a slightly new format with new hosts. Its new, official title is Save or Die! Expert Edition in homage to the Expert Boxed Set. The main man behind the wheel is none other than +James Spahn himself. Now, if James reaches out and asks a favor of you, who among us would say "No!" Not I, as I owe James much over the past few years, so I readily agreed to join James in his newest endeavor. Along with James and I, +Vincent Florio and +Glen Hallstrom also agreed to be part of the newly assembled team. For me, it is almost a homecoming to my first podcasting experience, the Brainstorm Podcast. After hovering on Death’s Door for a few rounds, Save or Die continues! Save or Die: Expert Edition bursts on to the scene with Swords & Wizardry Light – an ultralight folio sized incarnation of the flagship Frog God Games fantasy roleplaying game. Join DM James, DM Vince, TM Erik, and DM Glen as they keep it light, keep it fast, and keep it fun! 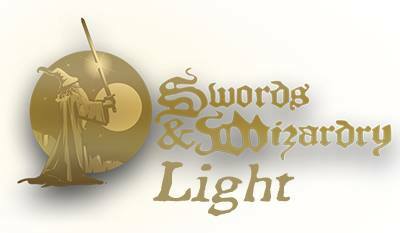 So, if you want some behind the scenes info (and some upcoming plans) of Swords & Wizardry Light, here's your chance. Art of the Genre has issues #12 & #13 of The Folio currently funding on Kickstarter. If you've been following along at home, AoG does some high quality releases and they release on time. 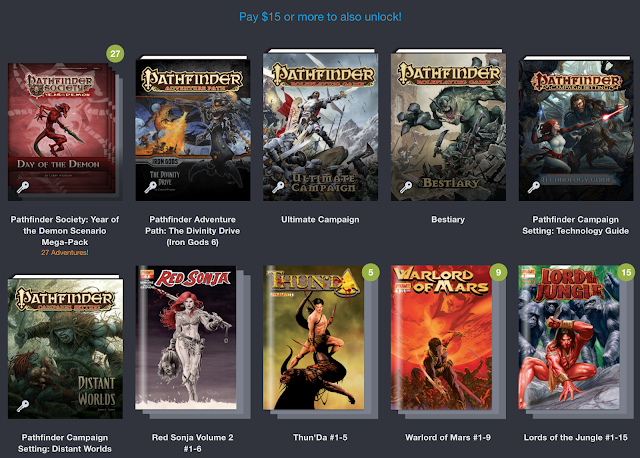 I know, that's a rarity among gaming Kickstarters, and R. Scott Taylor hits the mark each time. There really should be a Tenkie Award for such an achievement. 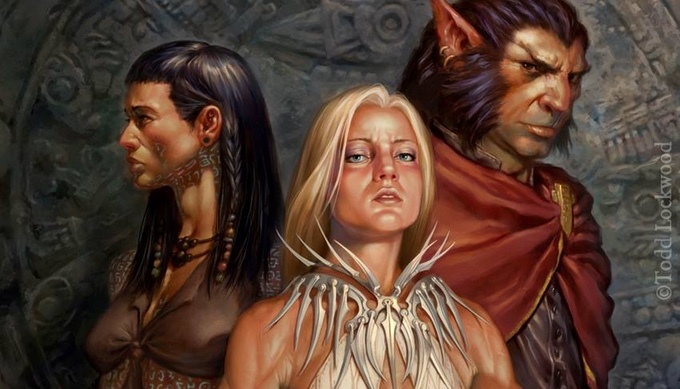 The art is top notch as always and I love the fact that the covers are folders like in the era of 1E. Yeah, I'm a sucker for nostalgia. Folio #12 & #13, along with the prior #11, which can also be ordered from the current Kickstarter, make of the City of Taux Trilogy. You get adventure and setting material in each issue. Game information is given in both 1e and 5e format, so it is both OSR compatible as well as with the latest edition. I haven't been disappointed with a Folio yet, but I am the type of GM that constantly mines my collection of gaming material for ideas and twists in my campaign. 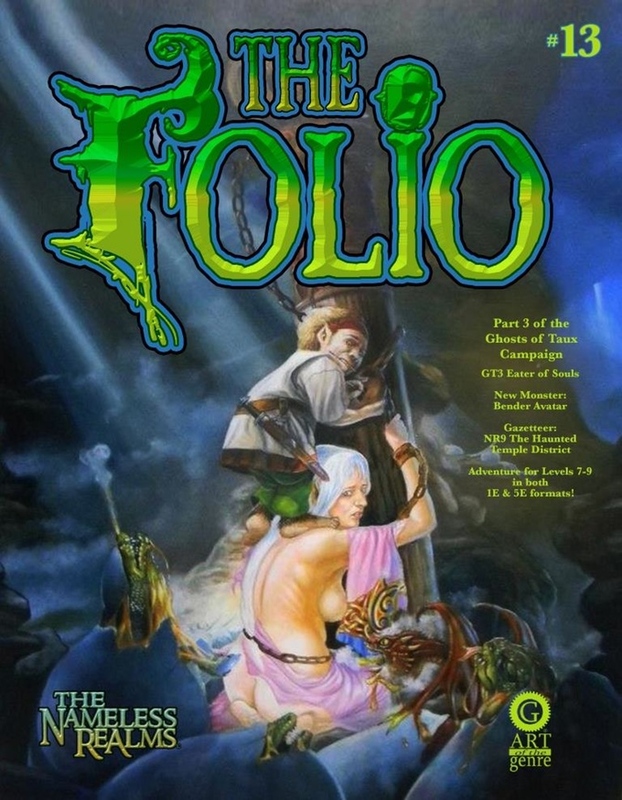 The Folio series has been an excellent resource for me.